WINTER is finally coming to an end and the hiking trails of the spring season are reopening. There are some gorgeous hiking spots in Utah, Arizona, and New Mexico that are in their prime in the springtime. 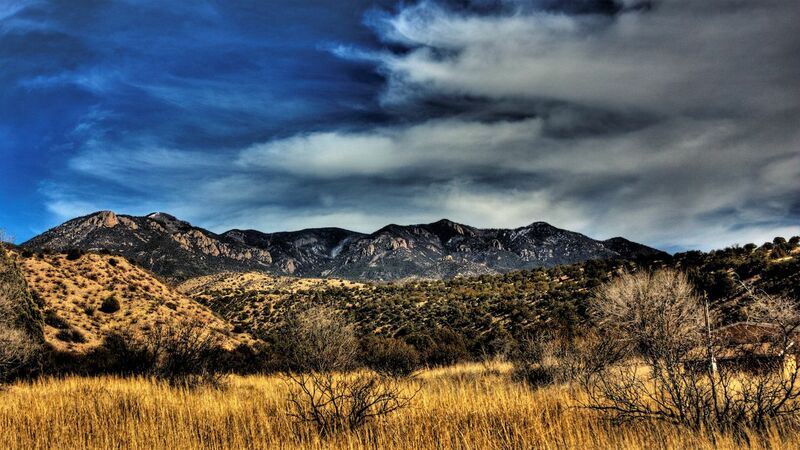 So, if you’re ready to stretch your legs into a new hiking and camping season, check out these 10 Southwestern trails that are ripe with amazing hiking opportunities. 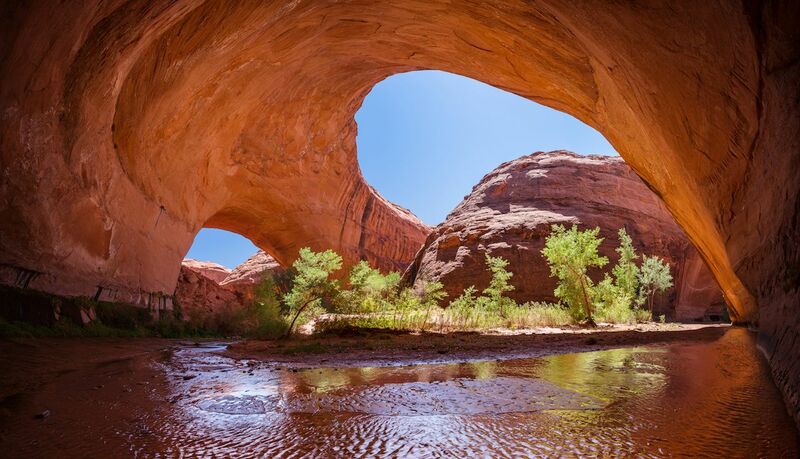 On a two to three-day backpacking trip in Coyote Gulch, you’ll see sandstone arches, waterfalls, towering rock formations, and you’ll get to hike through the winding river bottoms and view the Escalante River. The sandstone arches are carved over years by the corrosive forces of ice, water, and wind. In the gulch, The Stevens Arch has a 225-foot span and is 160-foot tall, making it one of the largest in America. The Jacob Hamilton Arch has eroded directly over a river and hikers can walk through its center. The river is usually running at a depth of ankle to knee-deep in soft sand. Hikers can comfortably walk for a portion of the trail barefoot in the cool water. The gulch is a popular destination in the Escalante area, but be warned, getting there is isn’t easy. To reach the recreation area, you must travel on Highway 12 until you turn onto Hole-in-the-rock road. Do not expect to make regular highway times on this road — it is a car-punishing, dirty washboard that can be completely impassable after flood conditions. A car with a higher clearance such as a Jeep or 4-runner is advised and you should call the NPS ahead of time to check the conditions. In the best of conditions, it is a slow, bumpy, self-doubt-filled slog to the trailheads, but don’t worry, the gulch is definitely worth it. Because getting to the trailheads takes a while, if you are trying to push for a big hike on the same day as your drive in, you need to start early. If you get a permit at a visitor center on your way in, you can also car camp at a trailhead the night before your hike. There are various turnoffs on the road for other trails and canyons as well. To tackle Coyote Gulch, there are several starting point options that offer hikes ranging from two miles to over twenty. The trails can be combined or sectioned to make a multi-day backpacking trip. Have some fun planning your route and check out other iconic parts of the gulch like the rock formation “crack in the rock,” so named because it is two big pieces of sandstone sandwiched together with just the slightest crack for hikers to press through. The squeeze is so tight, you will probably not fit if you are packed for an overnight stay. The closest town is Escalante, Utah where you will need to gather all of your supplies. There is river water available on the hikes, but you will have to filter it before you quench your thirst. If you prefer to purchase store-bought gallons ahead of time and not mess around with river water, buy plenty of it. At an absolute minimum, you will be drinking half a gallon a day in the heat (keep in mind you have to carry it). Always have a map and compass with you (maps are available at all of the grocery stores) because GPS can be unreliable and canyon hiking can be disorienting with limited trail markers or cairns leading the way. Following the river gets confusing in places, with multiple trails weaving down the gulch, so a map will help you follow the river down the gulch and navigate the hole-in-the-rock road. This is not a trip for your canine friends. Leave the pups at home, they aren’t allowed in the gulch and it’s too hot to leave them in the car. 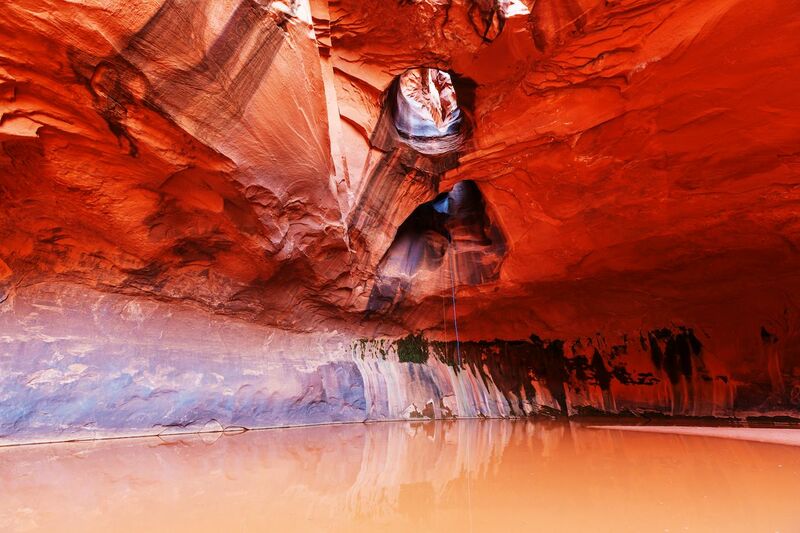 Water creates some amazing sights in nature and slot canyons have to be up there with the most awesome ones. Slot canyons are full of tight twists and turns in the rock and zebra-like patterns and stripes in the sandstone. When the sun hits them, they create a cascade of red and orange colors. Peek-a-boo Gulch and Spooky Canyon are located right next to each other and a combined trail leads you on a 3.5-mile loop to see both. These canyons are also located off Hole-in-the-rock road at approximately the 26-mile mark, so this hike can be combined with a trip to see Coyote Gulch. You will make one turn onto Dry Fork Road and stay left to park at the trailhead. A trailhead sign greets you and warns you of the dangers of hiking in the desert and of getting caught in a slot canyon in rainy conditions. It is very important to know the weather before you enter a slot canyon. The walls are pinched so closely together that, in some places, you need squeeze through. When water enters there is nowhere for it to go but up and rapid filling can occur, so always check an up-to-date weather forecast and pop by the visitor center for current conditions. Regardless of the weather, the bottom of these canyons rarely see sunlight because of their depth, so there is usually standing water in them. Commit to getting your shoes wet or take them off — the sandstone is forgiving on bare feet. Since the water never sees the sunlight, it is chilly, and the weather in the canyons may be cooler as well, so dress accordingly. You may find a length of strong webbing useful on this hike for children or first-time canyoners. There are a few spots where you will have to pull yourself up a few feet to the next level of the canyon. A buddy with a strap can give you a helping hand. There is no drinking water on this trip so pack it in. There is also not a lot of privacy on this hike, so take care of your restroom needs ahead of time to avoid an awkward encounter. If you are claustrophobic, this is not a hike for you. Some of the sections are barely a person width wide and parties will have to use courtesy and patience when the canyon is busy to maneuver around each other. In case you are still not convinced that a trip down the Hole-in-the-rock road is worth it, the Neon Canyon/Golden Cathedral is a third hike option off that road. This trail starts at the trailhead “Egypt” about 15 miles down the road. It passes through neon canyon and winds through river reeds and Escalante crossings. The canyon ends in a sandstone dome with skylights in the ceiling. There is usually a pool of water collected underneath which is sometimes deep enough for a swim. The rock formation gets its name from the glow it takes on when light enters the dome through the holes in its ceiling. This is an out-and-back trail with a round-trip mileage of about 9 miles. It will probably take hikers the majority of a day to hike it as a day trip. Any overnight stay requires a permit from the visitor center. If you want to camp in this area you will need to stop and get one before you drive the road. This trail is not well marked and can be difficult and frustrating to follow. You will need a map and patience to find the correct route. It is always a good idea to speak with a ranger before your trip so they can answer any questions and point out current conditions of the trail. Take your time finding the correct trails and occasionally look behind you to clock the scenery to help you on your way back. As always, bring plenty of water to drink and be prepared for the desert heat, even in spring. Prepare for this hike the same as the Coyote Gulch and Peek-a-boo and Spooky canyon trails, there are no services nearby and you will need to be completely self-sufficient. The Needles gets its name from the spires of sandstone that congregate in pillars on the landscape. 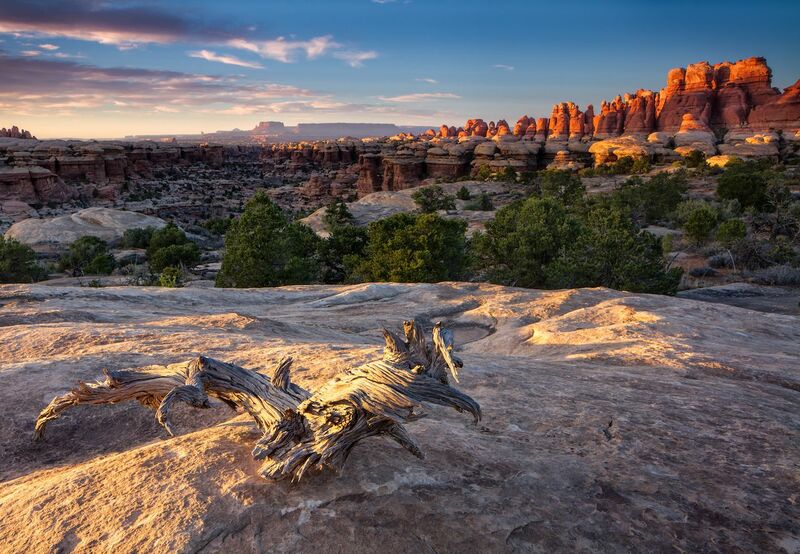 A hike in this area offers amazing views of striped, colorful sandstone formations and high desert arches. There are 60 miles of trails in the park you that can utilize for day hikes or a backpacking trip. Use the map to plan your route. If you are going to be camping in the park, you will need to pick your campsites ahead of time and stop in at the visitor center prior to your trip to pick up your backcountry permits. Grabbing an annual National Parks pass saves you money over the year with entry into all of the parks and some additional perks. Take careful note of the backcountry regulations to help make sure you and your group stay safe during your trip. The trails in the park are easy to follow and are well maintained by the rangers. Water here can be quite limited, so it is important to ask rangers about the current status of water sources. Canyonlands is located south of the town of Moab. You should supply here with food and fuel for your stoves. As always, check the weather before you head out. The Grand Canyon is an expansive park with both the North and South Rim accessible to visitors. 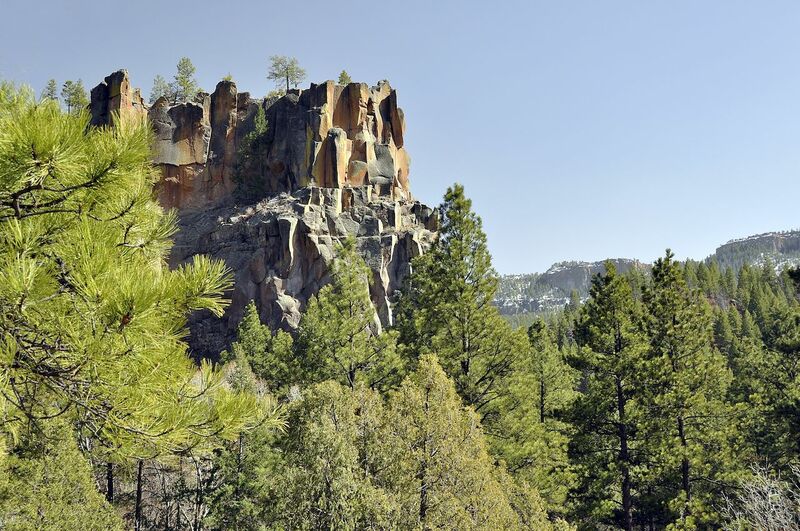 Springtime is the perfect time to plan a visit to the less-visited, crowd-free North Rim of the canyon (it reopens from its winter season on May 15th). You can find all related information on the North Rim road closures and backcountry reservations here. Visitors can arrange to hike on various trails all the way to the South Rim and have a shuttle return them to their car on the North Rim. Scroll down on this page to the rim-to-rim shuttle service section for details. The North Kaibab Trail is one of the more challenging hikes in North Rim part of the park. It can be hiked as an out-and-back trail with a total distance of 28 miles. 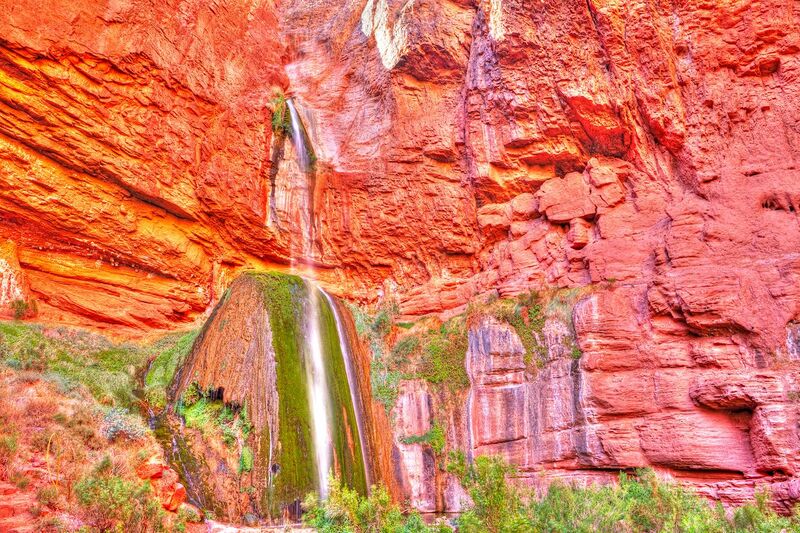 The North Kaibab Trail has some amazing sights along the way: a tunnel made of sandstone that you hike through called Supai Tunnel, and a 100-foot-high waterfall called Ribbon Falls. The trail is very steep, which increases its difficulty. It has nearly 3,000 feet of elevation change dropping into and leaving the canyon. Leave your group more time for the return and uphill hike out of the canyon as the going will be slower. Most people hike this trail in three to four days. There are two campgrounds that make planning an itinerary for the hike very easy. Cottonwood Campground is 6.8 miles from the trailhead and Bright Angel Campground is 14 miles from the trailhead. If you choose the traditional route of this trail, you will end at Bright Angel Campground and begin your return hike. Get your permits ahead of time for the campgrounds using the online reservation system. Or try your luck with the lottery system at the visitor center the day of your trip. Be prepared for unpredictable weather in the spring. Your group may encounter snow and cold temperatures in the evening and desert heat during the day. Always consult weather predictions ahead of time and pack in layers for warmth. Paria Canyon and the Vermillion Cliffs area are home to some of the heavy hitters of the desert hiking scene. Buckskin Gulch can be found here, a canyon with a towering height that is uninterrupted for 21 miles. It is the longest and deepest of its kind in the surrounding states. It is also the most dangerous. There is a high risk of flash flooding when rain enters the canyon, and because of its depth and length, there are limited places to escape. There are entire trees wedged into the canyon thirty feet up from the power of flood water. Respect this hike and learn how to stay safe when canyon hiking before your trip. 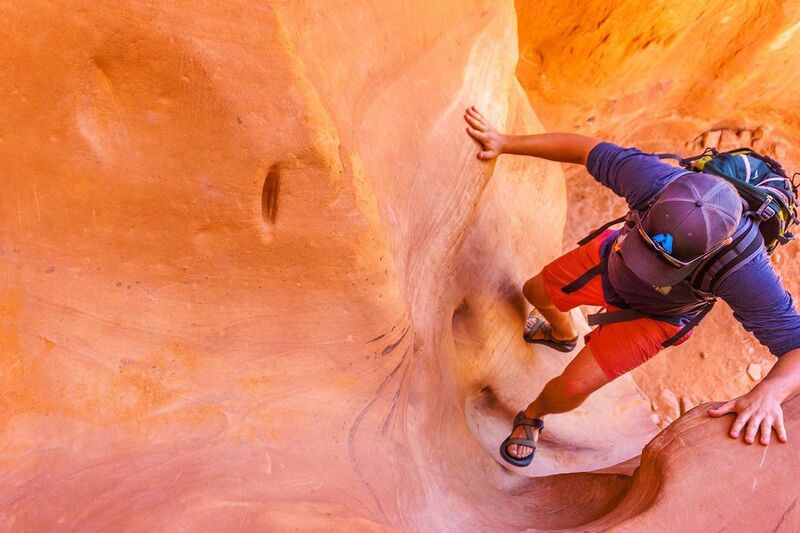 There are multiple ways to enjoy Buckskin Gulch. It can be explored as a day hike or hiked as a two-day adventure with campsites at the confluence. This site is a great source for planning your route. Carry a mapand compass with you at all times in the backcountry. Permits for day hiking are available at each trailhead. There is also a fee for parking, bring small bills or checks. They do check, and you will get a ticket if you don’t pay the fee. If you want to do a long day hike you can check out the local shuttle services that will pick you up at the end of your hike and return you to your car. This way, you can hike the canyon in one direction without the need to walk back. If you want to overnight in the canyon you will need a backcountry permit from the BLM (Bureau of Land Management). Permits can be applied for ahead of time using the guidelines on this website. However, sometimes there are permits available on the day-of if there are cancellations. Be prepared for wet and cold weather. The sunlight does not reach into the bottom of these canyons. Standing water is usually present from runoff. They can range in depth from ankle to shoulder-deep and the water is silty and mucky. Trekking poles are useful to gauge the depth of the mud before stepping in the water. Bring a change of clothes and a pack that you can carry over your head for water crossings. Also, keep in mind that it will be colder in the canyons than the surrounding desert because of the lack of sunlight. Once you are in the canyon, there are no places to exit. You will have to finish the hike or turn around and return the way you came if something goes wrong. Pack in all of your water. The water in the canyon will be heavy with silt and debris and difficult to filter properly. The Wave is another very famous rock formation in this area. 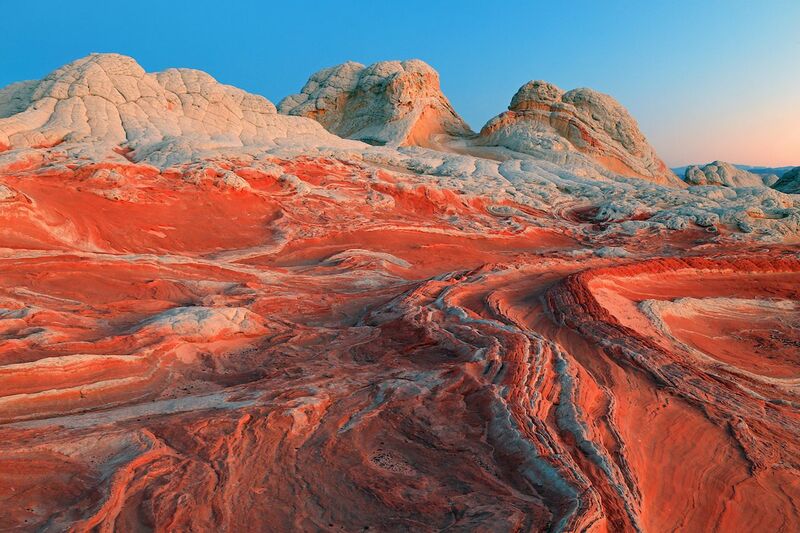 It is a large sandstone formation that resembles undulating waves and is striated with vivid colors. Obtaining a permit to visit The Wave is very tricky, and many people try for years. There is, however, a walk-in lottery every day for permits, so you may get lucky. The tiny town of Glenwood, NM is the closest town to the start of the Gila loop trail. This trail is a 21.5-mile loop that is a good two or three-day backpack for the average hiker. It passes over the ecosystems of the desert mesa and river valleys. It also features a natural hot spring a mile from the trailhead. The forest is home to a variety of wildlife. During your hike, you will be in the habitat of elk, bighorn sheep, foxes, and porcupines. To begin the hike, drive past the Gila visitor center here and park near the end of Highway 15. You will start your route at the Gila West Fork Trail. Take the time to visit the center for the most up-to-date information on park conditions. While you’re there, visit the Cliff Dwellings National Monument. The cliff dwellings were created by an ancient people now known as the Mogollon Culture. The dwellings are built directly into the sides of the cliffs using loose rock and shale. When you are ready to begin your backpacking trip, you will not need a permit. Plot your route on a map ahead of time and always carry a compass with you. There are multiple river crossings on this route, so be prepared to get your feet wet. Trekking poles are always a good precaution when crossing rivers for gauging depth and providing stability. Bring a form of water filtration with you to refill your supply. As always, be prepared for varying weather conditions and pack versatile clothing and the proper camping equipment. Located near the town of Jemez Springs, McCauley hot springs is a good day hike option and easier hike for a more relaxing day outdoors. Battleship rock is a common starting point for the six-miles-out-and-back hike. Bring some small bills to pay for parking. There is a waterfall and opportunity to swim in the springs on this hike. There are small fish that live in the pools that will nibble your skin while you are swimming. This trail gets busy, so if you are looking for privacy, you will need to visit early or during weekdays to avoid the crowds. Take caution to follow the appropriate trails to the spring as there are some false side trails that will lead you astray. Bring a map if you can and research your route ahead of time to stay on course. 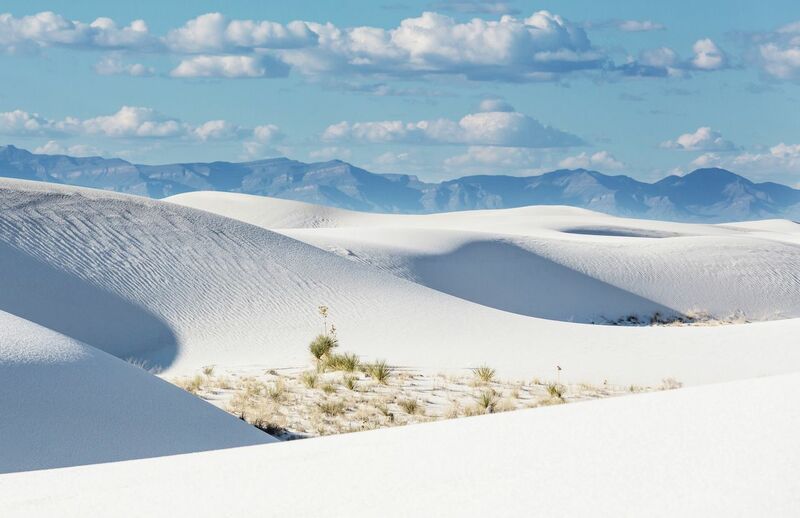 White Sands National Monument is a unique natural formation. Gypsum has gathered here in such abundance that it has grown into large sand dunes. The gypsum gives the dunes their bright white coloration and they stretch on for miles in the park. The Alkali flat trail offers views of some of the larger dunes and treks for a total distance of five miles. The trail is marked with poles and signs but it is still tricky to stay on track due to the shifting nature of the sands. Use caution when route finding. Pack all of your water in and start early. The trail heats up in the day and no water is available on the dunes. It is also possible to camp in the park with a permit. The camping is tightly regulated and you will be issued a campsite number. Permits are not reserved ahead of time and are available at the visitor center. Get in line early to make sure you get a spot. Fun fact, the park is located next to an active missile range. If you come across any objects resembling a missile or projectile, the park advises you not to touch it for risk of explosion and alert a ranger of its location. Besides day hiking, you can sand sled and go on full-moon hikes. The park’s things to do page can give you some ideas. 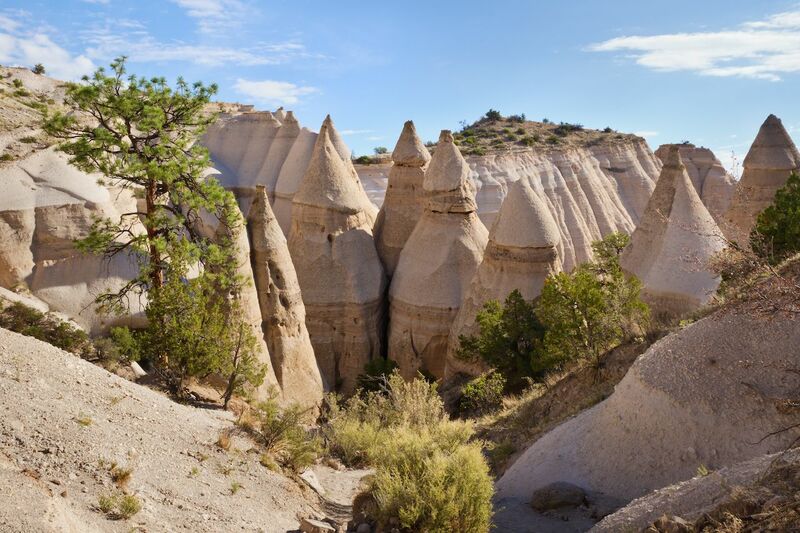 Near the town of Cochiti Pueblo, Kasha-Katuwe Tent Rocks National Monument surrounds a natural rock formation created from volcanic activity millions of years ago. The collection of debris from the explosions forms towering Hoodoo rock formations that line this trail. Some of the monuments stand as tall as 90 feet. In places, the trail narrows into a narrow slot canyon with striated rock formations. The trail is not long or difficult. It is only about 3 miles in length with moderate elevation changes. It is very popular, however, so if you want to avoid the crowds get moving early. The site is sacred to the Cochiti Pueblo people, so it is important to stay on the trail and respect the space as sacred ground. The park is also closed for periods of time during religious ceremonies and observance, check the BLM website for updates. Pets are not allowed in the park and parking costs $5, unless you have the National Parks annual pass which waives this fee. Get there early to avoid waiting in line to park. Bring water, snacks, and dress in layers to adapt to the current weather conditions. There is limited shade on this hike so a hat, sunscreen, and sunglasses are necessary.